The Import Chronicles is a seasonal podcast series aimed at having an open discussion about topics specific to Import American Football players. As the host of the podcast, Perfect Pervis interviews various people involved in American Football in Europe, as they give informative answers and opinion. Today, the topic is New Country, New Home. Vincent Pervis interacts with his guests on the podcast, but has supplied his own answers to the questions asked during the interview, in written form below. Should Imports consider their living situation as temporary, or ongoing with the possibility of being permanent? I believe Imports should embrace their living situation like a college semester. For 3-6 months (typically), you live in that country. Make life as routine as possible, leaving room for scheduled excursions and travel. Wake up, eat breakfast, hit the gym, watch film, go to practice, and spend your free time with teammates and friends. This type of routine will keep you grounded, but allow you to embrace the country as well. What necessities should Imports expect to have access to when abroad? The word necessity is open to interpretation in most countries. An import should expect to be supplied with a reasonable accommodation (at least their own room) and the amenities that come with it: linens & towels, furniture, kitchenware, cleaning supplies, and any other basics that can be reasonable offered by the team. Every team in Finland should be able to provide a coffee maker! Transportation is a little trickier depending on the city and country, but most imports have access to either a car, a bus/train card, or bicycles. It’s not uncommon for teams to volunteer teammates to chauffeur imports, if transportation options are limited. Who is responsible for helping Imports understand the differences in laws and cultural norms abroad? There should always be some sort of liaison for import players. Whether it’s a player, coach, or team affiliate, someone should be assigned to help imports adjust to the differences in country. Europe is different from the United States in many ways, but each country also has differences that might need to be explained. I promise you that living in Rome, Italy is NOT the same as living in Kouvola, Finland! The differences need to be explained, whether the import is an experienced veteran or a first-year rookie. What type of cultural exchange is usually expected from Imports? Imports have a duty to become ambassadors for their country/region when playing abroad. Local teams will share their culture with imports, but also are intrigued to know the cultural norms of the imports. 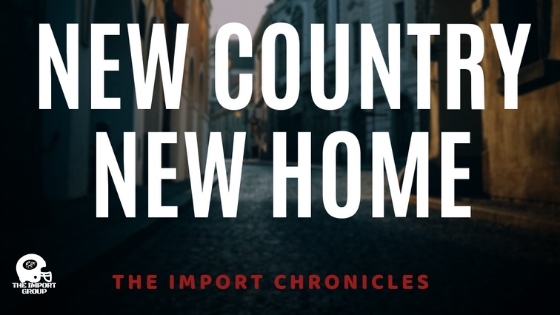 If you are an import, you are more than accustomed to saying, “Back in ______ we do this or that.” An import usually leaves a country knowing more than he did before he arrived, and people he spent time with should feel the same about him. Disclaimer: This article is property of The Import Group, written with the intent to inform the international football community about various topics important to everyone involved. Media outlets are allowed, and strongly encouraged to post this article on their websites, blogs, and social media channels, provided this disclaimer is included. Thank you for respecting the author rights of The Import Group.